REVIEW: SportDOG SD-1825 Review by Steve Snell. 2019 UPDATE: The SD-1825 has been replaced with the new SD-1825X. The SportDOG SD 1825 is easy to use and versatile. 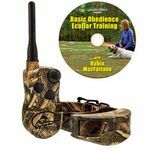 It's designed for anyone to use including pet owners, obedience trainers, bird hunters, rabbit hunters, and waterfowl hunters. If you REALLY like camo be sure to look at the SportDOG SD-1825 Camo before you pick the SportDOG SD 1825! The SportDOG SD1825 comes as a one-dog system, but you can add a second collar and a third collar at any time in the future if your needs change. Do I want to train with continuous stimulation or momentary? Do I want Vibration or Tone? What if I want BOTH Vibration and Tone? How much Range do I really need? How many dogs will I want to control from one transmitter? Do I need a regular stimulation collar or does my dog require a stronger stimulation level? Is the collar's stimulation too strong for my dog? What if I have a mild temperament dog and another one that requires a much higher stimulation level? What if I need a different level for a softer dog? It can be hard to make some of these decisions since many of our customers have never USED a training collar before. I only use Continuous Stimulation, but you might prefer momentary. What if you think you want momentary and you buy a collar that only has a momentary heavy setup, and then find out 6 months later that you really prefer to train with continuous? If you go with some brands of ecollars, you are screwed. The SportDOG 1825 gives you the option of customizing your system to fit YOUR needs. It also allows you the option of changing the setup as your needs change or if you want different options in different situations. The SportDOG SD 1825 may just be a revolution in ecollar technology. 5 years ago SportDOG came on the market and gave us features that the older ecollar companies had refused to add to their systems. If it were not for SportDOG we would not have waterproof transmitters or expandable multi dog systems. The next time you drop your transmitter in the water, make sure you thank the boys at SportDOG for forcing the other companies to step up. Now SportDOG has done it again putting the highest level of versatility in a long range e-collar. Oh, and did I mention it does all this for the low, low price of $289.95? Want one yet? 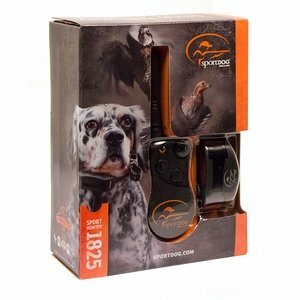 Here's the product page for the SportDOG SD-1825 here. The most amazing part of the SportDOG SD 1825 is the versatility in the transmitter. This unit is designed so that you can select the stimulation settings that fit your needs and you can change them if your needs change without having to purchase a new unit. The SD 1825 has 13 different transmitter mode selections that allow you to pick the setup of your transmitter. Feature choices on the transmitter include Continuous, Momentary, Tone, Vibration, Low Continuous-High Continuous, Low Momentary-High Momentary, 3-dog Mode featuring one button per dog (Continuous or Momentary based on the toggle switch), tone with stimulation delay, +2 jump level, and a programmable continuous hot button. While that sounds like a bunch, I find that most folks are going to find the right setting for them and stick with it. I use two different modes depending on if I am training or hunting. When I am training I use the Low Continuous-High Continuous mode. When I hunt I run the 3-dog Mode featuring one button per dog. Changing transmitter modes is quick and easy. The 1825 is the first SportDOG system to offer vibration. We have had vibration on other brands but SportDOG gives us a new twist. Other SportDOG systems only had tone. The tone / vibration combination allows folks that want more options in non-electrical stimulation to have a few options. The problem with other systems is that you have been limited on the number of commands you can teach with only one non stimulation option (tone OR vibration). The 1825 gives you both. Teach your retriever to sit with tone and to recall with vibration. Teach your pheasant dog to quarter on vibration and to recall on tone. Work an entire field without ever making a sound. Use Vibration as a warning and Tone as a praise command. While I am not the biggest supporter of warnings with ecollars, I do understand that many folks want this option. They may not use it in the long term or they may start out using it and change methods later. The nice thing here is that we have a system that ALLOWS you this feature if you want it. The advantage with the 1825 is that if you want to try out a warning option, you are much better of to go with vibration over tone. Since you can add and remove vibration to the mode set up at any time, the 1825 gives you the option of trying it out, but you are not stuck with it when you want to try something else. The 1825 is listed as a one mile range system. While I have not range tested it in every terrain yet, we got a little over 2 1/2 miles out of it in North Dakota this fall in flat open terrain. Yep. 2 1/2 miles. We will be doing more tests with this, but it beat every other system we had in its category. What was also really cool was how it gets full range no matter the angle of the collar in relation to the transmitter. The placement of the internal collar antenna can determine if you get the same range when your dog is coming toward you as when he is turned away. The SportDOG SD 1825 comes as a one dog system and you can add up to two additional dogs at any time making it either a one, two, or three dog system. All of the functions work for the one or two dog selection. When you go to a three dog set up, you are limited to mode 7 (eight levels of continuous and eight levels of momentary) with each dog having a separate button for stimulation selection. I prefer this mode when working with multiple dogs. While it does not give me as wide a range of stimulation choices (you only have 8 in the one button per dog mode), I find I don't need that level of detail when I have three dogs on the ground. What if the stimulation is too strong for my dog? One of the new features of the 1825 Collar is the ability to raise and lower the overall stimulation level of the system. The 1825 collar can be set at three different stimulation levels. The collar has a Low, Medium and a High stimulation setting. This allows you the ability to find the exact stimulation level that your dog needs. You can also set multi dog collars at different levels if you have dogs that need more or less stimulation than other dogs in your pack. Several of my dogs require the high stim collar, but the majority of my herd uses the Medium setting. Collar Turn On Button -- Every time you use your new system you will first turn on the collar. It needs to be quick and easy, but not so easy that the collar can turn on OR off when it is on the dog. The 1825 button is easy to get to, easy to activate, and I have not had any issues with it turning on or off by accident. I am also very pleased with the size of the button. It is large enough that it is easy to find and use. Collar Strap Buckle -- The next thing you use is the collar strap buckle. Buckles need to be well made, secure, and easy to put on and take off your dog. SportDOG has a new buckle that I love. It's a combination roller buckle with the K9 (Square) buckle design with rounded corners. It's super easy to put on and the most secure design in a collar buckle. It is not going to come off in the field if you put it on correctly. Transmitter Buttons -- The next part that you will interact with is the transmitter buttons. One of the downsides to waterproof transmitters is that they have to have waterproof buttons. Many of the buttons that are waterproof are either squishy, too small, or too hard. SportDOG makes the best buttons. They are a very comfortable size and react correctly when you press them. This sounds really simple but it's a rare thing. Transmitter Dial -- The last of the four main features is the stimulation dial. Dials need to be easy to turn, but not so easy that they turn on their own. They must have a tactile feel so that you KNOW when you have changed levels. They also must be easy to use in multiple situations including hot, dry, wet, or humid weather conditions. It is also important that you be able to use a dial while wearing gloves. The only thing SportDOG makes that is better than their buttons is their dials. The 1825 dial has a great feel and a rubber coating that gives you the perfect grip -- easy to use in all weather conditions and works well with gloves. The SportDOG SD 1825 transmitter is small enough that it isn't in my way, but it fits in my hand and is durable. It has the "tactile" feel in the transmitter dial that I want. I can change levels without looking at the transmitter. I can also select which dog I want to correct using the toggle switch and never take my eyes off the dog. I can also operate it one-handed. Using my thumb, I can change levels at the dial and I can operate the buttons. This makes life easy. No need for two handed operation that you get in so many of the high-end collars on the market today. I always have something else in my hands when I train. I don't want to have to put down anything to operate my transmitter. Period. I also need a multi-dog system. I use the collar on the neck and I use it on the belly for teaching "whoa." I also sometime like to run three bird dogs at the same time. Because of the customizable transmitter, you can use the SportDOG SD1825 as a training collar AND as a hunting collar. I use the MODE-2 (16 levels of continuous stimulation "two dog") set up to train. When I get ready to run three dogs at the same time, I quickly switch over to MODE-3 (8 levels of continuous, 8 levels of momentary with one button for each dog). In the field, I really prefer the "one button per dog" option. I find it makes keeping up with my dogs easier. The SportDOG SD- 1825 comes preset to MODE-1 straight out of the box. Many folks will like this set-up. 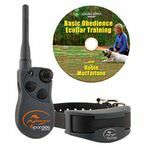 (Lower Button: Momentary, Upper Button: Continuous, Side Button: Tone) This gives you an 8-level continuous, 8-level momentary collar with a separate tone button independent of stimulation for both Dog 1 and Dog 2. I prefer MODE-2 (toggle switch down) which gives you 16 levels of continuous stimulation. Using the Intensity Dial (1-8), the Lower Button gives you 8 levels of Continuous Stimulation in the bottom intensity range, and the Upper Button gives you 8 levels of Continuous Stimulation in the top intenstity range. This setting gives you a wide choice of stimulation levels that will allow you to work with even the most sensitive dog. You can also use this mode in a two dog set up using the toggle switch and the Add-A-Dog extra collar. If you prefer to use momentary stimulation than you would like MODE-2 (toggle switch up) . This gives you 16 levels of momentary and 16 continuous (1-8 low and high) with a separate tone button. I use my remote collars to train. For training, I need a collar with a wide choice of low level continuous stimulation. I also need high levels for stopping the "unwanted chase." The SD 1825 features a new slim-profile collar design. The 1825 collar is designed to fit closer to the dogs neck and give a better profile look. The SD-1825 uses a 3/4 inch collar strap. It is smaller than any collar receiver in its price and feature range. I am really pleased with the look and feel of these new collars. It took me a very short period of time to adjust to the 3/4 inch strap. After using it for a while, I really prefer the size. It's amazing how much this small change makes in how the collar looks on your dog. It helps me since my dogs wear regular ID collars, the 1825 collar and at least one tracking collar. I am also a really big fan of the shape of the collar. While the size isn't really that much smaller than other brands, the shape fits closer to the dog's neck. This makes it look smaller and less noticeable. Another new feature in the 1825 collar is the ability to change stimulation settings at the collar. The collar has a low, medium, and high setting. This allows you the option of finding the correct range of stimulation for your dog. Lower the overall stimulation choices for more sensitive dogs and raise the levels for hard headed or stubborn ones. This is a really neat idea and has some cool applications. What's nice about this is that you can change the power output on the collar if you need to. If you have a really hard headed dog then turn it up. If you have a more sensitive dog you can back it down. The best part is that you can run different powered collars from the same transmitter. Say you have a hard headed brittany and a mild tempered GSP -- really, it can happen. ;) Set one collar on high and one on low. This way you won't have to make as big of a transition at the transmitter dial when working the two dogs at the same time. SportDOG now uses rapid charging Lithium Ion batteries. This gets us a quick charge (two hours from a completely drained battery) and longer run time between charges. SportDOG also is now using docking stations or cradles to charge the 1825 collars. This is great since it eliminates the need to directly plug into the collar to charge it. This helps with waterproofing and keeps the collars cleaner. This is an area in which SportDOG has been running behind compared to other companies. We are pretty glad that they have added this feature to the new line and look forward to the other collars in their brand catching up. The SD-1825 has a beeper option that is available separately. The 1825 is also compatible with other SportDOG "5 series" systems, including the SD-425, 825, 1225, 1875, 2525, and 3225. You cannot use it with older transmitters or collars, such as the SD-400, 800, or 1800.